(2012). Formation of Needle Like Hydroxyl Apatite by Polyelectrolyte-modified Inverse Microemulsion Technique. International Journal of Bio-Inorganic Hybrid Nanomaterials, 1(1), 59-65.
. "Formation of Needle Like Hydroxyl Apatite by Polyelectrolyte-modified Inverse Microemulsion Technique". 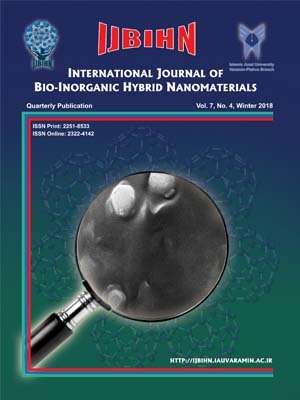 International Journal of Bio-Inorganic Hybrid Nanomaterials, 1, 1, 2012, 59-65. (2012). 'Formation of Needle Like Hydroxyl Apatite by Polyelectrolyte-modified Inverse Microemulsion Technique', International Journal of Bio-Inorganic Hybrid Nanomaterials, 1(1), pp. 59-65. Formation of Needle Like Hydroxyl Apatite by Polyelectrolyte-modified Inverse Microemulsion Technique. International Journal of Bio-Inorganic Hybrid Nanomaterials, 2012; 1(1): 59-65. In this work needle like hydroxy apatite were synthesized in a reverse microemulsion droplets of water in cyclohexane, separated by a cationic surfactant and co-surfactant, in the presence of Na-polyacrylate (PAA) as an anionic polyelectrolyte. Characterization of the as formed HAp nanoparticles at the room temperature were carried out by X-ray diffraction (XRD) and Fourier transform infrared spectroscopy (FT-IR). Size and morphology of the samples were investigated using scaning and transmission electron microscopy (SEM and TEM). The results obtained confirm incorperation of PAA as a template in controlling of the size and morphology of HAp nanoparticles into the individual microemulsion droplets.